Burmester 099/956 Mk2 review | What Hi-Fi? Over the years we’ve come to expect certain things from Burmester products. The 099/956 Mk2 pre/power combination conforms to type. A chrome front that can double as a mirror in emergencies - tick. Top-drawer build and finish - tick. Eye-watering prices - tick. Last, but by no means least, superb sound, again, tick. This pairing comes from around the middle of the luxury brand’s amplification range, yet by most standards it’s still very much at the cutting edge as far as all-round ability is concerned. The 099 is a well-equipped unit as far as line-level high-end preamps go. Burmester has long been a believer in the advantages of balanced signal transmission so it’s no surprise to find all three of the 099’s line level inputs are of the balanced XLR variety. The brand hasn’t been dogmatic about this though, with the preamp supplied with adaptors that plug into the XLR sockets and convert them for single-ended use. As if to prove this pre is no traditionalist, Burmester has equipped it with a generous supply of digital inputs. There’s a trio of opticals, a duo of coaxs and a single USB. The optical options are limited to 24-bit/96kHz signals while the rest are happy to accept 24-bit/192kHz feeds. Some may not be impressed by these figures. In recent years, even some fairly affordable products have gone beyond these numbers, accepting signals as high as 768kHz for PCM files. Even DSD, so long a fringe interest, has gone mainstream (at least as far as spec sheets are concerned, if not in actual sales) so it comes as a bit of a surprise that the 099 doesn’t embrace these things. Burmester could argue that their preamp will play pretty much all the music files most people actually have, and we couldn’t disagree. The 099 is generous when it comes to outputs though. There are balanced XLR and single-ended options, an optical and coax alongside a 6.3mm headphone jack. That headphone output is inconveniently placed on the back panel, so you’ll have to go rummaging around if you want to connect a pair of headphones. This preamp is configurable too. The relative sensitivities of its inputs can be adjusted to take account of the differing outputs of various sources. Matching to a partnering power amplifier can be improved by changing the 099’s output between low and high ranges. Things like start-up volume and the way the remote changes inputs can also be adjusted. As there’s no display these things are shown using the 099’s front panel LEDs, which can be a little confusing at first, but makes some sense with familiarity. The 956 Mk2 is by far the more visually interesting of these products. Burmester has used the finned exterior design across a number of power amp models and it looks stunning. But there’s a practical purpose behind all that heatsinking; the amplifier runs relatively cool despite a power output that achieves the theoretical ideal of doubling from 115W per channel when driving a 4ohm load. As with other Burmester products, the 956 Mk2 is DC coupled, which means there are no capacitors in the signal path, so avoiding the innate distortions these components impart. The company has long tried to use low levels of overall feedback, and so it proves here, the engineers believing this kind of design gives a more natural sound. If for some reason a single 956 isn’t enough, you can obtain adaptor cables from Burmester to turn it into a bridged mono unit delivering around 500W output. Of course you’ll need two power amps – we can’t imagine a situation where anyone feels disappointed with the volume levels of such a system. 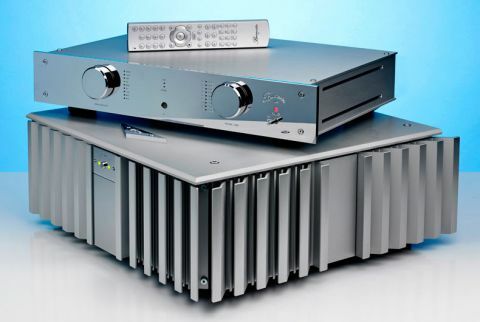 Take a look inside either of these Burmester products and we’re sure you’ll be impressed. Construction standards are excellent from the quality of the aluminium casework right through to the internal wiring and board layouts. The quality of the chrome finish is exceptional – deep and immaculately applied - and every switch and control feels like it will last decades. These products are designed for long service and things like the input selector or volume control mechanism should feel as precise after 10,000 turns as they do the first. If not, then it’s back to the drawing board. Some products take days of running before they shine, but this 099/956 Mk2 pairing sounds good straight out of the box. They get better over time too; their presentation becoming even clearer and more transparent. It’s essential to use top class partnering equipment. We used Naim’s NDS/555PS streamer as our main source with a Clearaudio Innovation Wood turntable package as back-up. The 099 doesn’t have a phono stage so we plumbed in our reference Cyrus Signature/PSX-R2 to perform equalisation duties. Our trusty ATC SCM50 speakers were used most of the time, with Monitor Audio’s hugely capable PL300 II stepping in on occasion. All cables were from Chord Company’s premium ranges. Once up and running this pre/power pairing sounds lovely. It prefers to charm rather than shout, delivering a smooth, almost creamy sound that’s easy to enjoy for hours on end. As we listen to The Light of the Seven from the Game of Thrones Season 6 OST it becomes clear that this is an impressively light-footed combination for something so muscular. It has agility with the piano notes and a delicate way with low-level dynamics that is unusual in such a power-packed product. This is a cohesive presentation too, with every sound from the lowest of bass notes upwards working together seamlessly to produce a convincing whole. Tonally, the presentation is full-bodied, with just a hint of extra smoothness and richness – it’s Burmester’s family sound and we wouldn’t expect any different – but none of it is taken to excess and it never intrudes on the transparency or believability of this pairing’s sound. As the piece builds it comes as no surprise to find there’s plenty of authority in the bass and the capability to deliver powerful crescendos with composure and control. And it does go loud, generating enough level for us to admit defeat before the amplifier showed any sign of stress. We found ourselves wondering why anyone would need a pair of monobloc 956 Mk2s when the standard single stereo does so well. Moving onto Kate Bush’s classic Hounds Of Love set shows these Burmesters capable of rendering the subtle textures and inflections of her distinctive voice brilliantly. There’s plenty of insight into demanding tracks like Cloudbusting, and the ability to keep track of the various instrumental stands without tearing the music apart. There’s solid punch and the sort of rhythmic talent that, while not the last word in enthusiasm, is certainly surefooted enough to convey the building momentum of the piece convincingly. We make a switch to digital from the line inputs and find the on-board DAC module is a good one. It preserves most of the impressive qualities we’ve heard so far through the line inputs, delivering a pleasing combination of detail, dynamics and authority. Even the USB – sometimes a disappointment in such products – is good, taking the signal from our Macbook Air (loaded with Pure Music software) and making it sound great. We go through a whole range of music from grimy-sounding Konnichiwa from Skepta right through to Holst’s Planet Suite, and are never left wanting more. Burmester’s engineers have done a fabulous job in balancing this amplifier; it has plenty of power but never sounds muscle-bound, it’s insightful without being clinical and has a sweet tonality while still convincing with instrumental and vocal textures. In short, it’s a sound that works with all types of material, good and bad recordings included. Despite our grumbles about the rear panel position of the headphone socket, we give it a go and we’re glad we did. These outputs are often little more than a box ticking exercise from the manufacturer, but that’s not the case here. Regardless of the headphones we tried – Grado PS500s and Beyerdynamic T1s – we got an impressive sound that mirrored the results through the main preamp outputs. If you want the last word in resolution or transparency, we would probably point you towards our reference amplifier combination of Gamut D3i/D200i. However, if you want a high-end amplifier that makes the most of your music collection and has a forgiving, sophisticated yet still entertaining balance, this 099/956 Mk2 combination must be heard. Factor in the excellent build and the well-proven service back up, and this pre/power becomes an excellent buy.